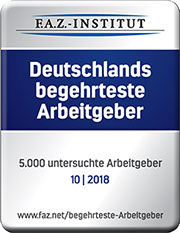 Rentschler Biopharma was awarded 2nd most attractive in "Germany's most sought-after employer" in the pharmaceutical industry in a study by the F.A.Z. Institute and the IMWF Institute for Management and Economic Research. On July 20th the second beach volleyball tournament was held by companies in the Laupheim region. In bright sunshine, more than 1,100 runners, walkers and Nordic walkers participated in the 8th “Lauterlauf” near Munderkingen on Sunday, May 6th. April 13, 2018 Visit us on the Campus Day at the Furtwangen University of Applied Sciences in Schwenningen. The 7th Campus Day, University Furtwangen of Applied Sciences in Schwenningens’ job fair, will take place on April 18th from 10:00 am to 3:30 pm. We kindly invite you to meet Rentschler Biopharma at the T5 JobMesse in the “Haus der Wirtschaft” in Stuttgart on April, 11th 2018 from 11 am to 4 pm. We kindly invite you to meet us at this year's Job Fair "fit for future" at the Kurhaus Isny on March, 14th 2018 from 9 am to 12 pm to find out more about career opportunities at our company.